Truly comforting care, AFTER SUN SOOTHING MILK for face and body intensely soothes, hydrates and nourishes skin after sun exposure and helps combat accelerated skin ageing, while beautifully enhancing your tan for longer. 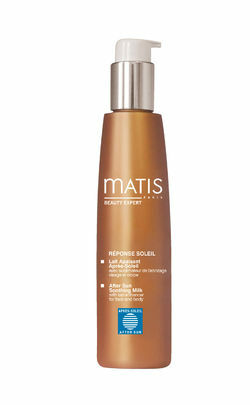 Immediately soothed, nourished and hydrated, skin is soft and comfortable and its tan beautifully enhanced. Apply generously to face and body after any sun exposure. Avoid all contact with eyes. *results as % satisfaction (answers ranging from "somewhat agree" to "agree") Use test under dermatological control, two applications a day for 4 weeks on 23 women.